Recently myself and blush – we just aint’ been getting on. I have never been into blush it’s been a step I have missed out or ignored, I think the last time I bought a blush was around 2 years ago and that was to go in my Mac blush palette which alongside my Illamasqua cream blush in Rude totals my sad little blush collection. I new this had to change as so often I’d look in the mirror and think, something’s missing or I look a bit dead. I had been lusting over Hourglass products for awhile and when I saw this bad boy it reeled me in hook line and sinker. I was worried it wouldn’t really have any pigmentation as it seemed on first appearances as a blush/highlight hybrid but on the contrary it is pigmented and has a natural finish – you can defiantly add a high light with this blush. They are soft and blend so effortlessly, I use my Real Techniques Multi Task brush or my Mac 168. The shades are beautiful, my favourite at the moment is the middle shade Incandescent Electra it’s a natural peachy pink that gives that fresh healthy glow. The first shade Luminous Flush is rather pink so I am not too sold on that one just yet – maybe in the summer when I don’t resemble Casper the friendly ghost, and the final shade is Mood Exposure (my second favourite and the only shade available in a single) it’s a mauve natural shade that’s easy with any look – this would be great with a bold lip, it gives something without screaming for attention on the face. Overall a winner, beautiful packing, easy to apply and blend, and did I mention the beautiful packing? 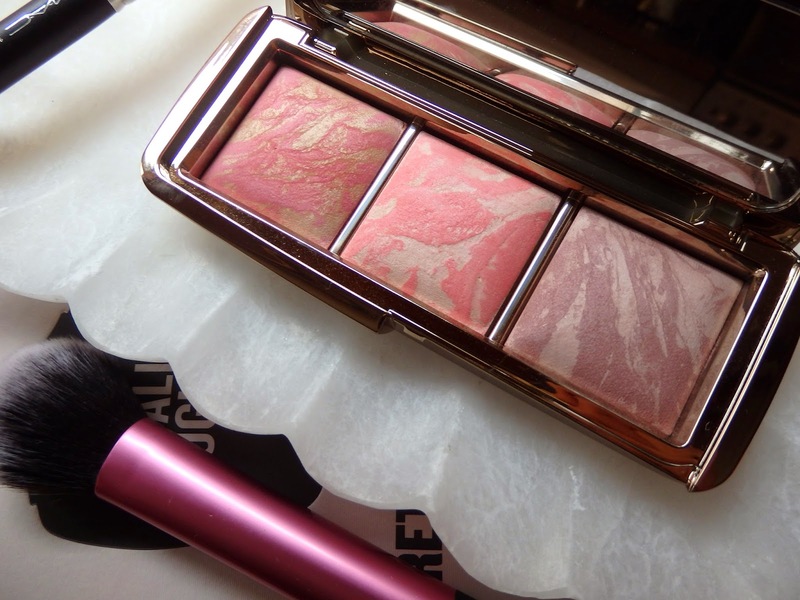 The palette is priced at £56 and is available from Space NK.